Don’t get upset because I am not giving you a FORK. This is the custom how to it the Kebab. I won’t eat like that ! What can we do, we’ll give the high society a FORK. 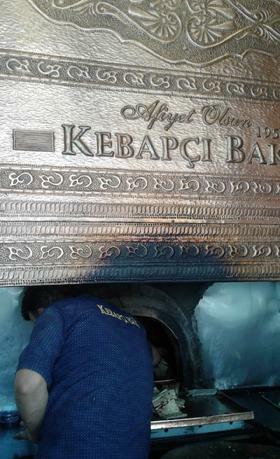 The sign on the wall hangs in the BAKI USTA Kebab restaurant in the Denizli province of Turkey. The small restaurant, seating only about 70 people is named after its founder Master Baki and run by the 4th generation of his family since it was founded in 1950. 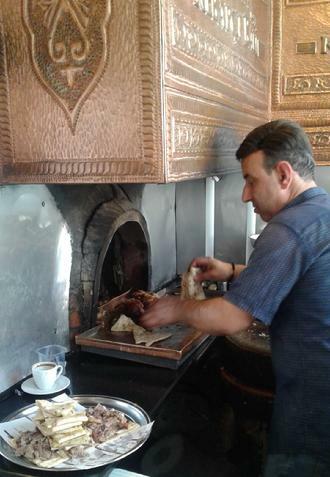 Baki Usta’s specialty and the only product they sell is the famous Tandir Kebap( Tandoori Kebab) which is made from lamb meat and cooked in a so called “fire brick” oven on pitted gumwood. The server taking the order usually asks you what kind of fat level in the meat you like high, medium or low. The kebab is served in an oval platter with the thin tandoori pide cut in small rectangle pieces circled around the rim of the plate and the meat in the middle. On the side is usually a dish of fresh cut tomatoes, green chili peppers and quartered white onions. You take one of the pida pieces, put the meat on top with your hand and bring to your mouth bite by bite. Although very few will opt for soda to drink most people order the famous Turkish yogurt drink called Ayran with a thick foam and served in traditional copper mugs. Mute volume of video due to high background noise. 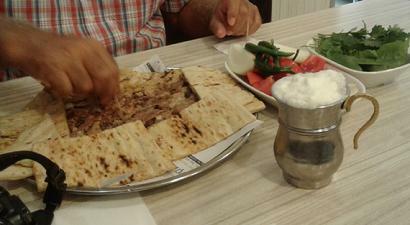 When we ate at Baki Usta’s restaurant last October with my friend, we were so full after the meal that we had to decline the desserts like baklava or künefe which they usually bring from a dessert shop nearby. Instead we asked for a cup of hot Turkısh tea and got ready for a walk in the market area of Denizli.